Gov. 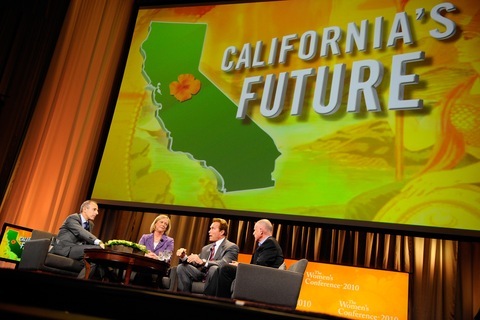 Arnold Schwarzenegger speaks as gubernatorial candidates Meg Whitman and Jerry Brown, right, look on during a discussion moderated by “Today” show host Matt Lauer. Photo by Kevork Djansezian/Getty Images. The cheers that welcomed Meg Whitman at an event Tuesday in Long Beach, Calif., turned to boos after the Republican gubernatorial candidate refused to withdraw negative television ads for the rest of the campaign, as her Democratic opponent, Jerry Brown, pledged to do. The exchange came during an appearance by the candidates at the annual Women’s Conference, which was likely their last face-to-face encounter before Election Day. When Lauer pressed the Republican nominee for a clear answer, Whitman responded: “I will take down any ads that could be even remotely construed as a personal attack, but I don’t think we can take down the ads that talk about where Gov. Brown stands on the issues. I just think it’s not the right thing to do.” The crowd began to boo as she finished the statement. Schwarzenegger, who has said he will not endorse either candidate, had kind words for both Whitman and Brown. He said Whitman would “make history” if she becomes the first woman governor of California. And he praised Brown for doing a “great job as governor” when he served from 1975 to 1983. Most of the Democratic losses in Congress next Tuesday will likely come from the freshmen and sophomore classes who rode the Democratic waves into the House in 2006 and 2008. But with a national attitude strongly tilted against Washington and the folks in charge here, some veteran Democratic lawmakers will most certainly lose their jobs as well. The Hill 2010 Midterm Election Poll is out with its latest round of House race polls focusing exclusively on senior Democrats battling the toughest political headwinds of their careers. Of the 10 districts polled, none produced a tighter result than the at-large seat in North Dakota. The Hill poll (conducted by Penn, Schoen, Berland) found 45 percent support for incumbent Democratic Rep. Earl Pomeroy and 44 percent for Republican challenger Rick Berg. That may explain this closing 60-second television ad from Pomeroy in which he distances himself from House Speaker Nancy Pelosi and President Obama and appeals to voters to think twice before voting him out of office. Next door in South Dakota, the poll finds Democratic Rep. Stephanie Herseth Sandlin running slightly ahead of Republican challenger Kristi Noem, 45 percent to 42 percent. Four of the 10 incumbent Democrats tested are losing by double-digits to their Republican challengers, according to the surveys: John Spratt in South Carolina, Allen Boyd in Florida, Chet Edwards in Texas and Jim Marshall in Georgia. The Hill has full results here. As more Americans cast ballots before Election Day, the early vote statistics, just like any other campaign season metric, have become vulnerable to partisan spin. Both national party committees were working hard on Tuesday to declare that their team has the edge. But first, let’s take a look at Gallup’s latest numbers on the subject. “More than a quarter of registered voters say they have already voted or will vote before Election Day next Tuesday. Early voting is highest among those living in the West — about 60% of whom have voted or plan to vote early — and older voters. There are only small differences in early voting by party at this point,” writes Frank Newport of the non-partisan Gallup polling organization. When Gallup surveyed registered voters who say they have already voted, it found 13 percent were Republican, 9 percent were independent and 9 percent were Democrat. Those numbers don’t seem to reflect the wide enthusiasm gap that we’ve seen in likely voter models in pre-election polling. The strategist highlighted Nevada as an example of where the party doesn’t see an enthusiasm gap materialized. In Nevada, 26.6 percent of reliable Democratic midterm voters have already voted, compared to 29.5 percent of reliable Republican midterm voters. When you look at sporadic voters — those who vote in presidential elections but not usually in midterms — 8.2 percent of Democratic voters have voted, compared to 7.7 percent of sporadic GOP voters. The numbers are remarkably close among those who voted for the first time in 2008: In Nevada, 7.2 percent of first-time 2008 Democratic voters have voted, compared to 7.7 percent of first-time 2008 Republican voters. Republican National Committee Political Director Gentry Collins distributed a memo on Tuesday that looked at the early vote in key races and, unsurprisingly, gleans a different lesson from the Nevada data. “Democrats led in combined absentee and early voting by 11% in 2008. With 257,000 ballots cast so far this year, the Democrat lead has shrunk to 2%, or about 5,000 votes. Democrats have a 5% registration advantage in the state, meaning Republicans are outperforming registration by around 3%,” wrote Collins. Democrats note that to compare 2010 early voting statistics to 2008 early voting statistics is a flawed approach. Mr. Obama beat John McCain in Nevada by 12 points. Nobody is arguing that Sen. Harry Reid will be able to win by more than a whisker if he is able to defeat Sharron Angle. It varies by state, but on a broad national scale we have not yet seen the pronounced enthusiasm gap in pre-election polling match early voting returns. But don’t take that to mean that Democrats are poised for a good night or one that is less brutal than expected; it might just point to their ability in a few critical states to hang on to some of their own.